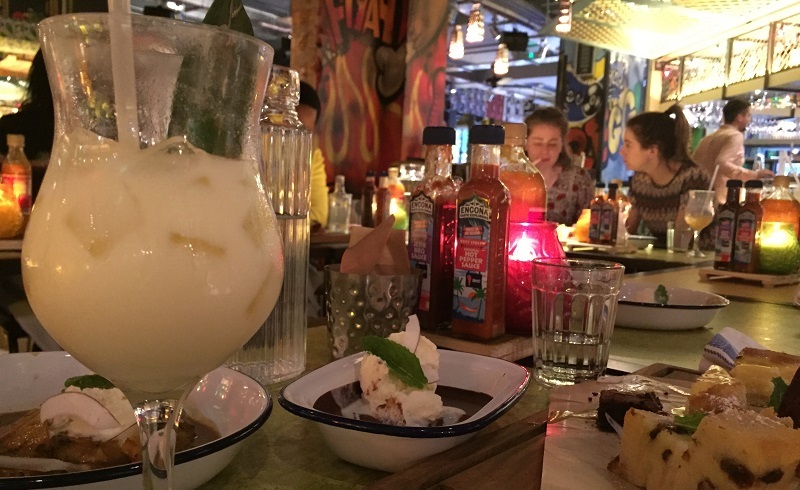 Turtle Bay’s latest venture just so happens to be situated in Solihull, a short drive from Birmingham. Which is perfect for us, but probably not so much for our bank balance. 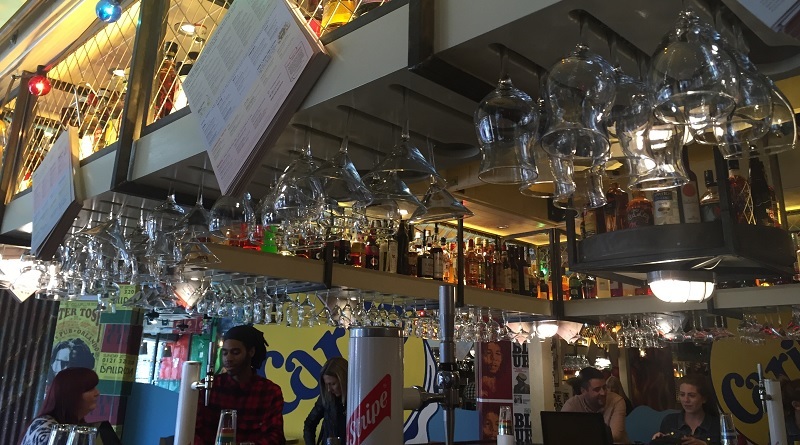 Solihull’s branch of Turtle Bay is nestled on Station Road next door to the White Swan Wetherspoons, a stone’s throw from John Lewis and Touchwood Shopping Centre. On Thursday May 26th we were invited to an exclusive VIP press event ahead of the restaurant’s opening on Tuesday May 31st, where we were able to sample the Caribbean delights on Turtle Bay’s impressive menu. 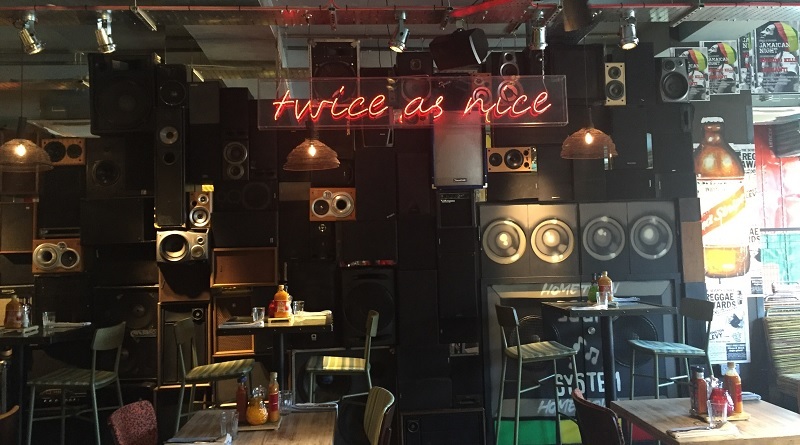 Turtle Bay pride themselves on unique décor and quirky features, such as cheese graters dangling from the ceiling as lights, posters across the walls, tyres for sinks and beach huts for toilet cubicles – all in presence at their new branch. We also spotted a few posters for Jimmy Cliff’s 2012 gig at the Ballroom, (formerly the Carling Academy on Dale End) adding a cool local touch to things. However, what stays throughout all restaurants is their square, island type bar, similar to those on Jamaican beaches. 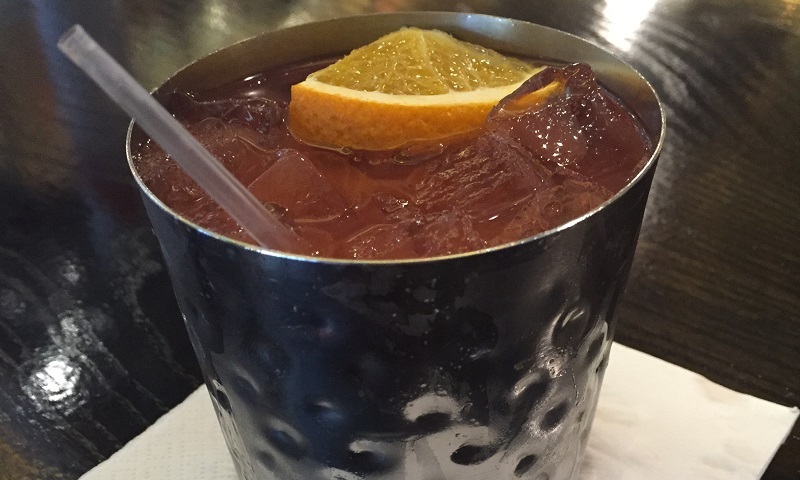 More than 40 types of rum are housed on the bar, anything from an orange-based rum, (the orange almost overpowers the rum and… I’m sure you can imagine drinking it like pop) to the world-famous Jamaican overproof rum, Wray & Nephew. Which comes in at a mental 63% vol. For starters, we had the Curried Chickpeas, which were lovely and toasty and carried a light spice. 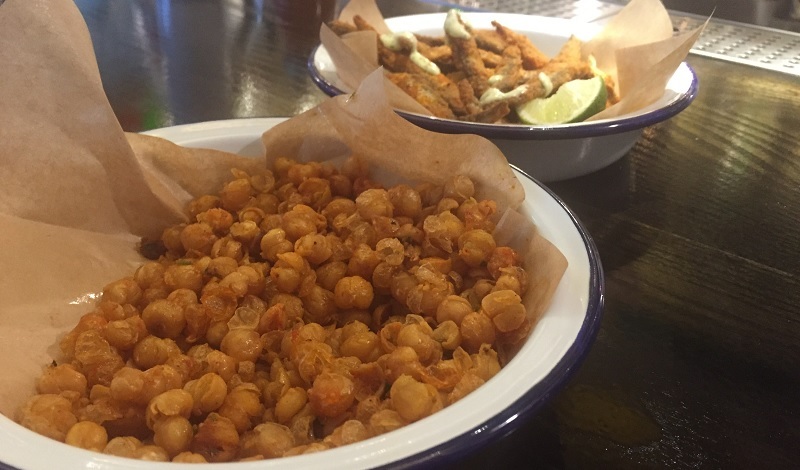 We also tried the Island Fried Bait, which were succulent, crispy and served with the great compliment of a fresh lime and coriander mayonnaise. As the spicy mains started rolling out – where do we start? 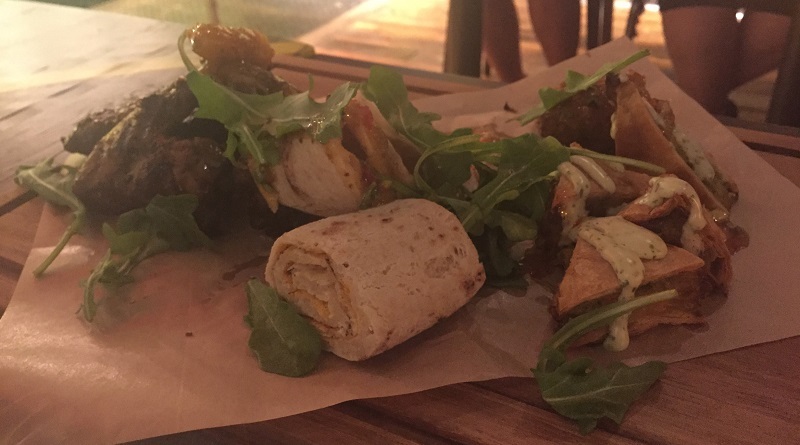 Firstly, if we thought the platter of wraps and chicken wings were good, that was nothing. 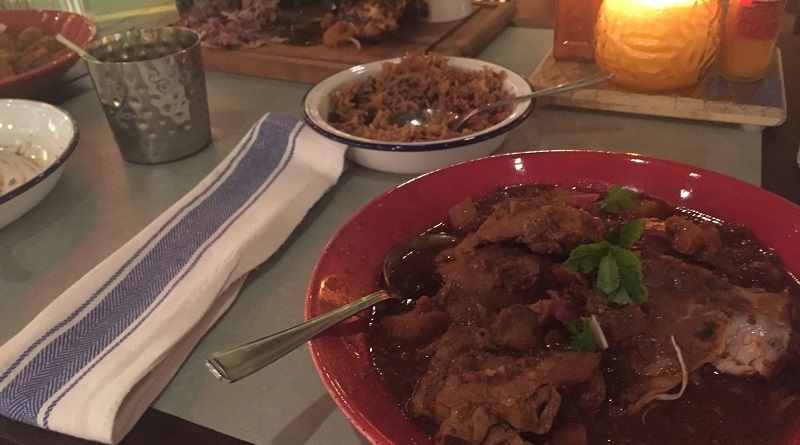 The jerk chicken, served with Turtle Bay’s trademark rice and peas, had been marinated for 24 hours in sauce and coated to perfection. Their Curry Goat, a personal favourite of ours, was as flavoursome as ever– the tender meat accompanied by scotch bonnet, sweet potatoes and dumplings in a rich sauce. We managed to somehow find room for their trademark deserts, including the delicious Spiced Chocolate Pot and coconut ice cream (which is effectively pure chocolate with a spicy kick), as well as the BBQ Pineapple, Dark Chocolate Brownie and my personal favourite, the delicately layered Banana and Toffee Cheesecake. We’ll definitely be having these again. A special mention must go to the staff on hand who went out of their way to make sure we were accommodated for with an abundance of food and drinks. 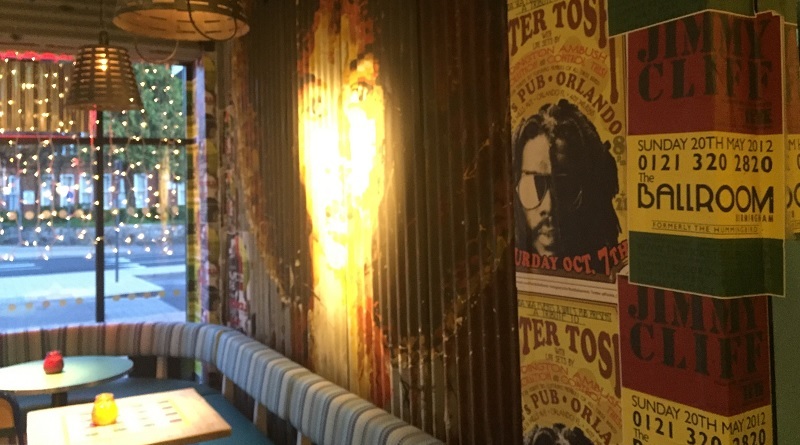 Turtle Bay Solihull opens at 11:30am on Tuesday May 31st and is at 36/38 Station Road, B91 3SB. The restaurant will be hosting a Pay As You Feel event on the launch night with all proceeds being matched and donated to Marie Curie Hospice. 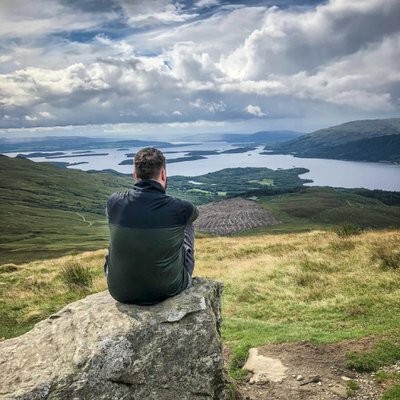 On Tuesday May 31st, customers will be asked to pay what they feel for their food rather than pay the price displayed on the menu. Drinks are not included in the scheme and must be paid for separately. Pay as you feel opening day is from 11:30am – 9pm. Tables can be booked online via Turtle Bay’s website, via calling the restaurant on 0121 711 3311, or customers can just turn up on the day.